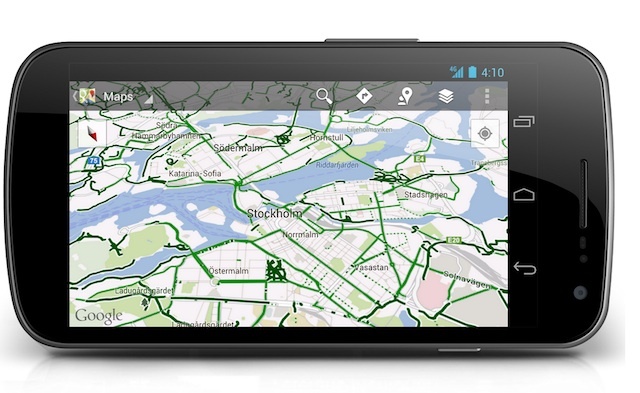 If you’re an avid European biker with an Android smartphone, you’re in luck. “Mount your device on your handlebars to see the turn-by-turn directions and navigation, or use speaker-mode to hear voice-guided directions,” Larry Powelson, software engineer for Google Maps, wrote in a blog post. In July, Google added desktop mobile biking directions for those 10 countries. This allowed user to research bike paths before heading on a trip, a commute or a jaunt around town. Now European riders can use their Android device as a on-bike navigator that can read directions aloud throughGoogle Maps Navigation, which is in beta. “Today, there are more than 330,000 miles (equal to more than 530,000 kilometers, or half a gigameter) of green biking lines in Google Maps,” Powelson writes. The U.S. and Canada have had Google Maps bike directions since 2010. The feature lets users chose their mode of transportation from a drop-down menu on Google Maps. Google Maps will tell you how long your ride will take, and show you the least-hilly route. If you plan to stop somewhere along the way, simply click and drag the highlighted path on the map to readjust your route. Dashed green indicates roads that are designated as preferred for bicycling, but without dedicated lanes. The blue line shows you the path you want to take. In the blog post from July, Kai Hansen, product manager at Google Maps, said the team is working to add more countries to the Google Maps bicycling feature. Will you use this new feature from Google Maps for bicycling in Europe? Tell us in the comments.